Welcome to Pirate and Princess Palace, a Disney-themed 4 bedroom, 3 bath villa with south-facing swimming pool, spa, and games room, all within an easy 7 minute drive to Disney World! Located in the gated resort community of Emerald Island, just south of I-92 and Animal Kingdom Park. There is 24-hour guard-gated security, club house with a fitness center, sauna, community pool, and a poolside Tiki bar for when you need to unwind. Disney-themed rooms means your family can be immersed in the magic all day, in the privacy of your own vacation home. For extra fun, there's even hidden Mickeys throughout! Best of all, the excitement and thrills of Disney World (entrance) is only 3 miles from your door. Our home is child and baby friendly, smoke-free, pet-free, and offers FREE wireless Internet and long distance telephone calls to Canada and throughout the US. We are proud to offer pool COOLING (extra charge) for those hot Florida summers! Pool and spa heating is already INCLUDED in posted rates. Every room is decorated with Disney magic in mind. 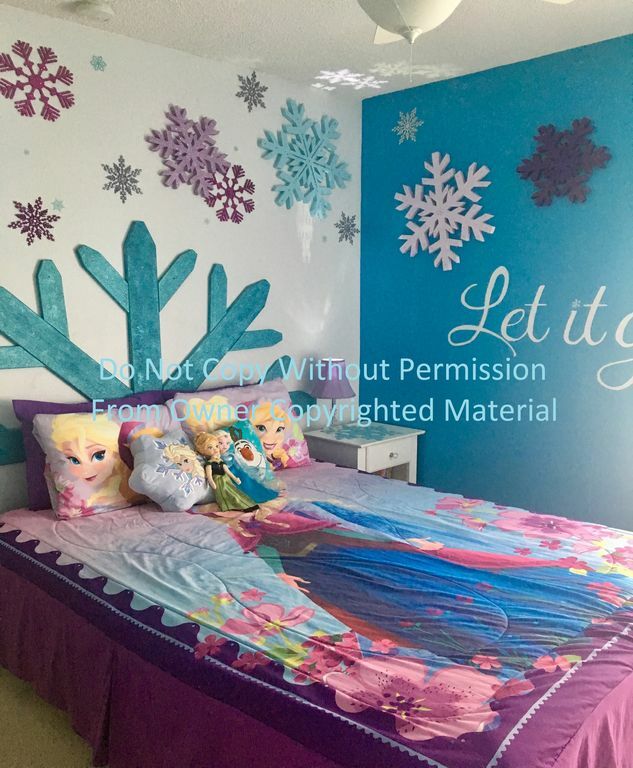 The kids will love the Disney Princess Frozen and Star Wars themed bedrooms, and you'll unwind in the exotic decor of the Aladdin themed bedroom, or the romantic Aristocats bedroom. The 2 master bedrooms both have king size, high-quality pillow top mattresses, and en-suite baths. They are situated on opposite sides of the house for privacy, which makes it ideal for 2 families or grandparents, to make it an extra special family vacation. The children share a 3rd bathroom, and is decorated in the ever-popular Toy Story theme and has stars that glow-in-the-dark. Enjoy breakfast in the fully equipped Mickey kitchen, pack lunch for the day, and you'll still be in the parks faster than if you had to eat on resort property. The kitchen dinette seats 5, and the formal dining area seats 6. Outside on the covered lanai you'll find a gas barbecue and a patio set that seats 6, for those looking to spend as much time as possible enjoying Florida's beautiful warm weather by dining poolside. After the parks, come home for a refreshing dip in the fenced private pool, or soak up some sunshine on the loungers. Finish off your day by watching one of the many movies on the 55” smart television or play the family-friendly games on the Nintendo Wii. Challenge the kids to some table tennis, air hockey, darts, or a Disney themed board game. Head over to the clubhouse and watch the kids play with new friends in the pool while you sip a margarita at the poolside Tiki bar, perhaps making a few friendly acquaintances of your own. It's hard to run out of things to do! Home is child and baby-friendly. We provide a pack 'n play crib, highchair, booster seat, strollers (single & double), pool safety fence, life jackets, and outlet covers. There are no window blind cords in the bedrooms. Please supervise children. We believe in treating all people equally and respectfully. Our home is LGBT friendly. Our rates includes pool and spa heating (heated to 84F and 100F respectively) and barbecue use (propane supplied by guests, if needed). End-of-stay cleaning fee is $105 plus tax. Note that we do not charge any extra booking fees. Any other fees are charged by this site, and not by the home owner. Our family of 4 (plus 1 cat) lives in a small town in Manitoba, Canada (about 2 hours north of Fargo, ND). Moving from the city to the country had been an interesting transition, but now we wouldn't have it any other way. We love to travel, and Florida is our favourite destination! Our most-loved parks are Magic Kingdom, Islands of Adventure, and Discovery Cove. We also like to spend a day at Clearwater Beach (about 90 minutes west from our home) just to relax, play in the ocean, and pick up some fun souvenirs! We purchased our own vacation home in 2009 to enjoy and share with other people who also love Orlando and all it has to offer! My favourite thing to do when we visit our vacation home is read the Guest Book. I love reading my guests' comments, and especially love looking at the drawings and notes the children write! Their excitement is contagious and gives me great pleasure knowing I helped even just a little to help make their stay memorable. We decided to purchase our own home in the Disney area after we rented a home to attend a wedding at Disney's Wedding Pavilion. We visited the Disney parks and SeaWorld that visit, and had the most amazing family experience. We were impressed with the beauty and convenient location of Emerald Island Resort. We had no idea we'd be owners and renting our own home the very next year! Call it Disney love at first site! Our home's check list was a long one. Our 'must-haves' included a south-facing pool, no rear neighbours, a covered lanai, a 24-hour guard-gated community, and be within minutes to the parks! It took over a year searching for accessories for the different theme rooms, and when we update the rooms, the process starts all over again, and I'm constantly on the look-out for treasures that make our house a home. I love it when our guests write to me after their stay saying how much fun they had staying in our home. It truly makes my day, and a big part of why we've been renting our home for over 9 years! All bathrooms have towels provided. Scented hand-made "Mickey soaps" is provided along with an initial roll of bath tissue. The Toy Story bathroom also has a step stool and potty seat that fits over the toilet. The stars on the wall glow in the dark! Max A/C to 72 F. All bedrooms have ceiling fans and window glazing (except for Aristocat Room, which is North facing). Oscillating fan in garage. Top-loading, extra large capacity. We try to provide laundry soap as a courtesy, but is not guaranteed. Recommend bringing "All-in-one" laundry soap pods from home. Extra large capacity, bring dryer sheets from home. Space for 2 average sized cars in driveway. Free street parking front of home. No parking available in garage, as it has been converted to a games room. Free Wi-Fi inside home. Business center located inside clubhouse 8 am - 10 pm for printing boarding passes, park ticket confirmation, etc. 2 sofas, seating for 6. Sofa converts to queen sofa bed (best for teens or young adults, not recommended for adults). Extra bedding provided. Novels for adults and Disney favourites for kids! Small amount of frontage, and grass around the house and back. Not suitable for recreation. Safety fence around pool. Beach toys in deck box. Life vests for little swimmers in deck box. Please keep children within arm's reach in pool area. NEVER LEAVE CHILDREN UNSUPERVISED. Tennis courts located within resort. See clubhouse for sports equipment (refundable deposit required). Many public golf courses within a short drive. Extra fees apply. Wheelchair also provided for guest use, free of charge. Call or email for lock code. South-facing pool, covered lanai area, 'light-show' in pool for night swimming, 4 loungers, dining table seats 6, safety fence, spa, pool blanket, deck box/toys, 2 life vests, no rear neighbours! Located at the resort clubhouse, with Tiki bar! Snacks and alcoholic drinks available for purchase. 3 week trip in Orlando! I would highly recommend this rental if anyone is looking for a nice clean and accommodating house in the Orlando area. The owner is very easy and pleasant to work with and the house is “stocked” with all the little extras one may need on vacation. I have rented a few different properties over the years when we comes to Orlando. Now that I have found this property it will be the first place I book in my future vacations back to Disney! We stayed at the Pirate and Princess palace March 1-8 and we had a wonderful stay. The house has everything you need and it was super clean and well maintained. The attention to detail in the theme rooms was excellent and our daughter loved the Frozen princess room. Shelley was very friendly, helpful, and answered any questions we had very quickly. I would recommend staying at this home to my friends and family. Amazing Disney themed home with everything you need for an awesome trip! This home was absolutely perfect! The rooms more decorated so cool with lots of attention to detail. The house had everything you could ever want or need for your trip. The game room was so much fun and there was lots of stuff in the house for the kids to do. The house was so clean and really made us feel like we were at home. Shelley was so easy to get in touch with and made planning this trip so enjoyable. We will definitely tell our friends and family about this house and would love to stay here again on all of our future trips. Thank you Shay for your review! I'm so happy to hear you all had such a fun vacation! I hope you will all be back soon! There are so many new additions coming to the parks in 2019 and 2020! This house was amazing!!! We've stayed at 4 different properties using vrbo and this was by far, the best experience! The owners attention to detail in the house was extraordinary. The pictures are fantastic, but in person, it's even better! The house was clean and everything as promised. You can tell that the house is well maintained and loved. Our family of six was very comfortable during our stay. We visited the Disney Parks, Kennedy Space Center and Sea World, as well as had a relaxing day at the house enjoying the spa and pool. I highly recommend this house to families! It was so nice for each of our four kids to have their own bed to be well rested for the next day's activities. The owners were kind and very responsive to any questions that I had. Loved this house!! Wonderful home decorated very thoughtfully. My kids felt immediately at home and loved their rooms as well as the private pool in the backyard. I have a boy and girl both almost 5 years old. The 2 rooms with king beds were themed very tastefully in Disney. Shelley, the home owner was very organized and had all questions and needs of the home covered. I would return back to this home for Disney 10 times over. This was our first Disney trip and I wanted to stay close but allow for a break from the parks/resort with the plan to visit the resort on a future trip. After this experience I feel I had many more Ammenities here. Wow! I'm so flattered that you thought our home had more amenities than staying on resort property. We visit our home at least twice a year for maintenance so we try our best to anticipate what our guests might need during their stay. I'm glad you found everything you needed! I hope to host your family again soon! Our stay was great! Great location in Kissimmee! Wonderful place to stay! The owner pretty much has everything in the house to meet your needs. We loved it! Thank you for your review! It's nice to hear that our home provided you with everything you needed for a great stay! I hope to have the pleasure of hosting your family next time! Pirate & Princess Palace is close to Disney, Universal Studios, Sea World, and numerous outlet shopping malls with top name brands. World class golf courses abound, and the coastal beaches are just over an hour's drive. Busch Gardens is about an hour and 15 minutes away. Kennedy Space Center is not much further and an educational wonder. Family-friendly restaurants are plenty and a good value for your vacation dollar.